Elise Hampel was born in Bismark/Stendal on October 27, 1903. After finishing elementary school she worked as a domestic servant. She married Otto Hampel in 1935. 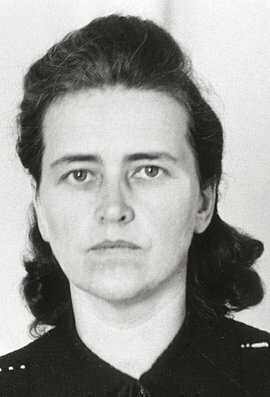 Elise Hampel joined the National Socialist Frauenschaft (Women’s League) in 1936, leading a group until 1940. Her brother’s death during the German assault on France prompted Elise and her husband to become opponents of the Nazi regime. From September 1940 until their arrest at the end of September 1942, they wrote postcards and more than 200 handwritten leaflets, which they distributed to mailboxes and staircases in Berlin, often near their home in the district of Wedding. The cards and leaflets encouraged people not to donate to National Socialist public collections, to refuse to serve in the war, and to overthrow Hitler. The Hampels were betrayed, and were arrested on October 20, 1942. Otto Hampel declared to the police that he was "happy with the idea" of protesting against Hitler and his regime. Otto and Elise Hampel were sentenced to death on January 22, 1943 by the 2nd Senate of the People’s Court for "demoralizing the troops" and "preparation for high treason," and murdered in Berlin-Plötzensee on April 8, 1943. Hans Fallada based his novel "Jeder stirbt für sich allein" on their story.